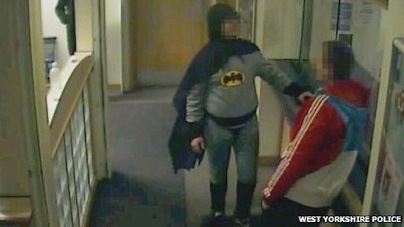 LONDON - A mystery man dressed as Batman demonstrated the same crime-fighting skills as the caped crusader when he handed over a suspect wanted for burglary in Britain. Surveillance footage showed a portly figure wearing an ill-fitting costume including gloves, cape and mask, bringing a 27-year-old man to a police station in Bradford in northern England. The suspect was arrested and charged with handling stolen goods and fraud-related offences, according to the force. But the costumed crime-fighter disappeared into the night without leaving his name. "The person who brought the wanted man into the station was dressed in a full Batman outfit," a spokeswoman for West Yorkshire Police said. "His identity, however, remains unknown." The suspect was handed over early on February 25. Police released photos of the footage Monday. Gotta admire the guy for doing that at least.